The Scots Independent Newspaper are delighted to be able to offer all our visitors the opportunity to listen to a Burns Supper in Real Audio format. 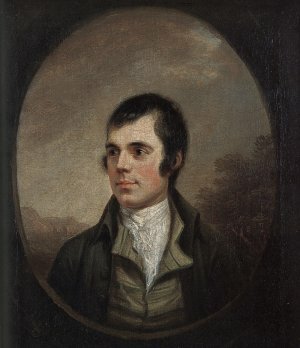 Burns Suppers are held to celebrate the birth of our national poet, Robert Burns, on 25th January each year. An Introduction - by Peter Wright, Chairman of the Scots Independent Newspaper. To a Haggis - by Peter Wright. Read words here! Selkirk Grace - by Peter Wright Try this option! Parcel of Rogues in a Nation - by Rod Paterson. Read words here! Banks and Braes of Bonnie Doon - by Gill Bowman Read words here! Tam o Shanter - by Marilyn Wright. Read words here! Ae Fond Kiss - by Gill Bowman Read words here! 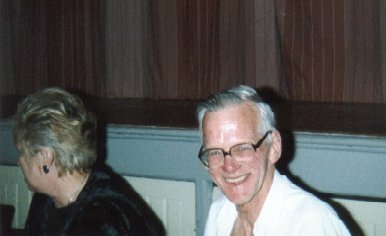 Auld Lang Syne - a song by Rod Paterson Learn more about this song here! We'd like to acknowledge our thanks to Greentrax for providing recordings of the pipe music and songs for us to include in this production. into the location window or click the above link. 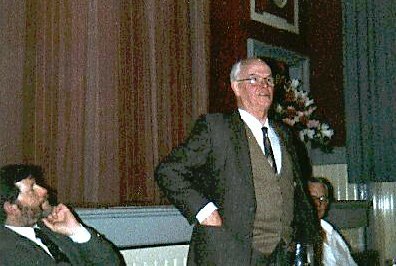 The only part of a Burns Supper we've missed out is the "Toast to the Lassies" and we are indebted to Carson C. Smith, FSA Scot for sending us in the one he gave at a recent Burns Supper at the Scottish American Club of Indiana. Download your full copy of the SI Burns Supper here! Burns Suppers come in all shapes and sizes! 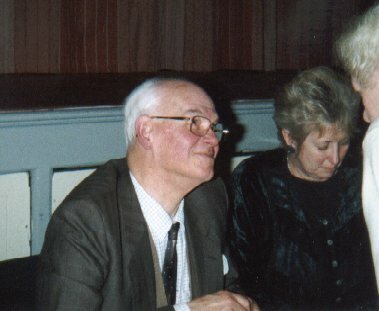 SI personnel were involved in two recent vastly differing Suppers with the common thread that they were both chaired by Peter Wright and The Immortal Memory given by James Halliday. 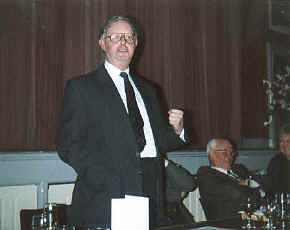 One, the Stirling CA SNP Burns Supper had a ‘real’ audience and the second only the four people taking part and a microphone. 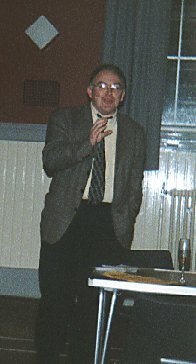 This was the first ever SI website Burns Supper recorded by the SI webmaster. 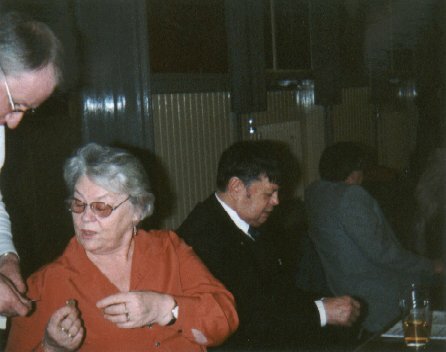 Use RealAudio to download your own instant Burns Supper. SI photographer Marilyn Wright was on hand to record the Stirling CA Burns Supper for ‘Flag in the Wind’. Chairman for the evening Peter Wright listening intently to the knowledgable and thought-provoking Immortal Memory being delivered by James Halliday at the Stirling CA SNP Burns Supper in the Victoria Hall, Dunblane. Dr Gordon Wilson amusing fellow speakers James Halliday and Christine Grahame MSP with reminiscences of his days as "Controller General" of Radio Free Scotland in the course of his splendid Toast to Scotland. 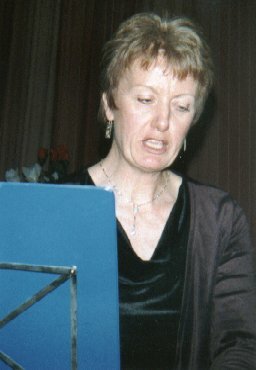 Singer Lyndsey Spowart wowed the audience with an entertaining selection of Burns' songs. 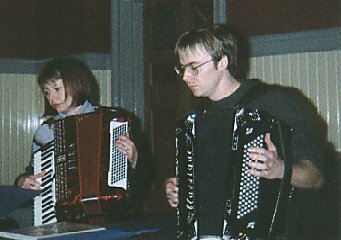 Accordian duo, Laura Richardson and Scott Bennett, set feet a-tapping with lively sessions of tunes associated with Robert Burns. 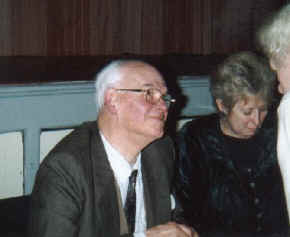 James Halliday enjoys an interval crack as Christine Grahame MSP ponders her reply to the Toast to the Lassies. Piper Neil Bell relaxing after piping in the Haggis. 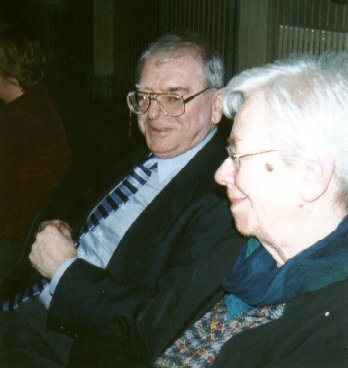 Doyen SI and SNP activists Jim Lynch and Helen Davidson enjoying the proceedings. No SNP event would be complete without the RAFFLE ! Mairi MacDonald readily stumping up. 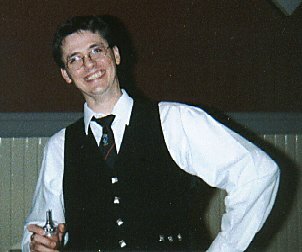 A cheery smile from Alistair Walker after surviving Christine Grahame's witty reply to his Toast to the Lassies. Gerry McLaughlan proposing the vote of thanks to the speakers and performers.